Solo is an extremely competent piece of filmmaking: it is definitely a movie that tells a story and has characters, some of whom you have met before, all of whom have specific goals and hopes and dreams. The performances range from good to quite good. The special effects are unmemorable but well executed. I remember action sequences being a part of the film, but couldn't really pinpoint a standout moment or signature shot in any of them. And maybe "fine" is good enough. Maybe there's enough nostalgia to sustain this franchise for years to come, enough primary and secondary and tertiary characters to generate legions of Star Wars Stories that will in turn generate endless billions for Disney. We'd better hope there are since we're getting one of these movies a year until we're dead—or Disney decides to start putting out two Star Wars movies a year. Alden Ehrenreich plays young Han Solo, a street rat from the ship-building planet of Corellia forced into a life of crime in order to earn food and shelter from a giant snake-like alien syndicate boss. When his girl Qi'ra (Emilia Clarke) is captured during an attempt to flee the planet, Solo joins up with the Empire in the hopes of learning to be a great pilot and returning to their home world so he can rescue her. Flash forward a few years and Han's not a pilot soaring through the vacuum of space but a grunt serving in the muck and mire of some swamp planet the Empire hopes to pacify. 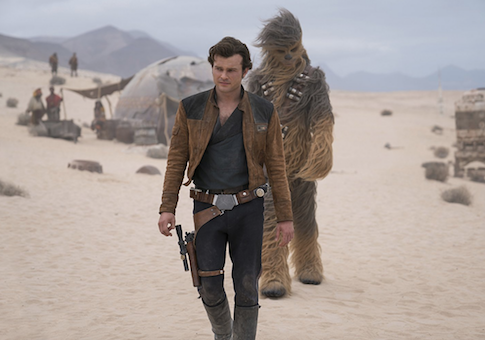 Desperate to get out of his service, Solo makes friends with a giant fur ball named Chewbacca (Joonas Suotamo) and joins up with a squad of criminals headed by Tobias Beckett (Woody Harrelson). Yadda yadda yadda, we meet Lando Calrissian (Donald Glover) and fly around in his spaceship, the Millennium Falcon, and bingo bango blah blah blah. As I said: it's all quite competent. Director Ron Howard keeps things moving. Ehrenreich is a pretty solid Han. Glover's Billy Dee Williams impression is both subtle and spot-on, a tricky combination; he nails the cadence of Williams's speech without trying to fully imitate his timbre or pitch or tone. And Glover's interactions with L3-37 (voiced by Phoebe Waller-Bridge), an obnoxiously opinionated droid committed to the cause of robot rights, are pretty amusing. Solo is at its most annoying when it is relying on callbacks to generate interest and sympathy, when it is referencing lines from films past ("I've got a really good feeling about this!") as a sharp elbow in the ribs reminding you that this is definitely a movie that takes place in a universe that we know and love. But it's a universe that we know and love and are starting to realize is quite small and blinkered: between the Skywalker Saga (Episodes I through VIII), Rogue One, and now Solo—which has the single dumbest and most vexing cameo in the history of the series; you'll recognize it when you see it—the galaxy far, far away feels like a galaxy that's far, far too tiny to maintain our interest. Granted, we'd be fools to trust the powers within Lucasfilm and the Mouse House to create new and interesting characters or exciting locales (see: Rose; Canto Bight) to inspire and amuse us. Maybe the world of Star Wars is inherently finite, a soggy mishmash of half-realized ideas that only really entertained because we cared about the actors and the characters and the light sabers at the heart of the original trilogy. Competence isn't the worst thing in the world, of course; I was never bored by Solo and it's only a few minutes over two hours long, minus the credits. It has some solid laugh lines; Han and Chewie remain a good duo. There's nothing overtly embarrassing about what we see onscreen, though one imagines there were a few red cheeks after the film's co-writer was reduced to musing out loud about Lando's pansexuality in a desperate effort to ward off criticism from the politically correct hordes. Still, Solo feels small and unnecessary and a bit pandering. Don't worry, though. I'm sure the powers that be will get the formula right over the course of the Solo trilogy. When they aren't putting the Skywalker Saga out of its misery, that is. And when we aren't waiting with bated breath to see what the creators of Game of Thrones do with their new series of Star Wars films. Oh, and when we aren't gasping with excitement for Rian Johnson's trilogy about, I presume, urchins who Force-sweep stables.